I just spent one of the happiest weeks of my life in San Pedro de Atacama, Chile. I ask myself: why did I adore my first experience in this place, the driest desert in the world, so much? It’s partly because I love to hike and climb and ride horses. But it’s largely because I didn’t have specific expectations. To begin with, I love the sea. I didn’t think the desert could compete. I’ve heard that the town of San Pedro is ridiculously touristy (it is.) Also, I am traveling alone. And I am traveling for work (researching northern Chile for Lonely Planet’s South America on a Shoestring guidebook) – I’m not on vacation. I didn’t know what to expect, exactly. 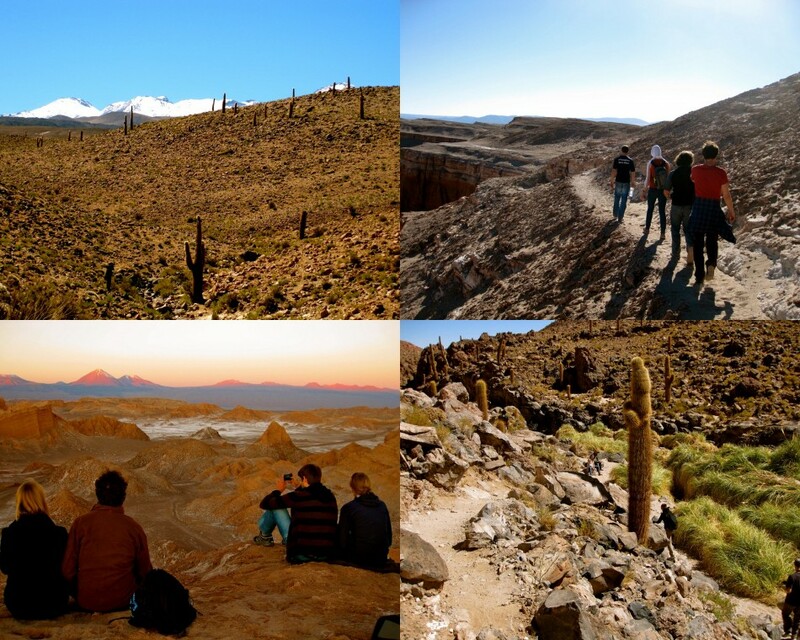 But now I get it – the Atacama is magical. Here, exotic cacti, hiking in Valle de la Muerte and sunset on a clifftop at Valle de la Luna. The world’s highest geyser field. 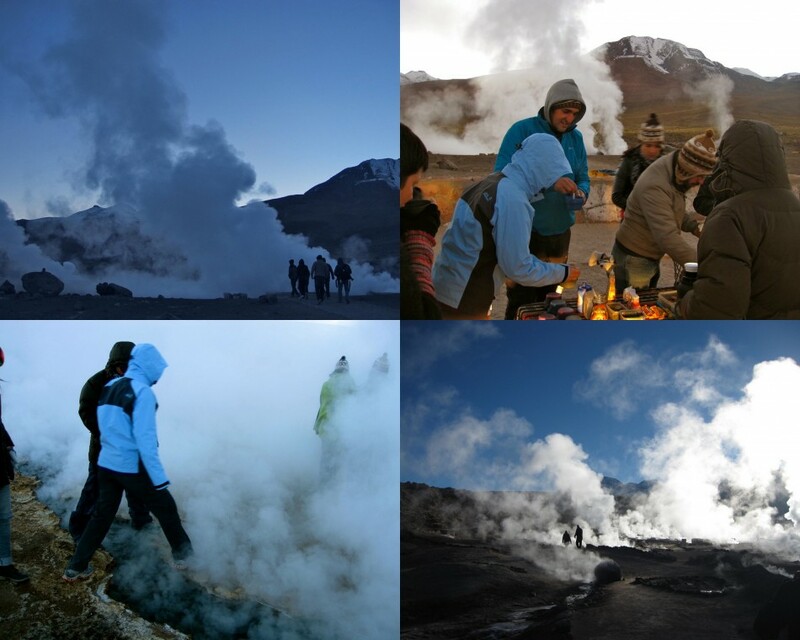 Breakfasting at El Tatio at dawn. Ascending a volcano, Cerro Toco. Elation at 5,600 meters. Cruising through the desert on a bicycle built for two. The charming old Iglesia San Pedro de Atacama and a walk down the dusty village streets. Swimming in high-altitude thermal waters – and in a mountain river. Horseback riding in the valley and wading through Lagunas Cejar. Stargazing at SPACE and hiking through the salt caves of Quebrada de Cari. I wouldn’t want to leave out a really important element of my trip: this past week, I had excellent, fantastically knowledgeable guides who taught me about the region and encouraged me to push myself physically. They’re a huge part of why I had such a wonderful time in the Atacama. Erich of Know Chile and Cactus Tour. Taught me to hear the ‘symphony of salt’ and made me run at full speed down a towering sand dune. Robin of Nomade Expediciones. Encouraged me to get in the water when I was cold, climb to high altitudes when I was scared, go out on the town when I was tired. Mauricio, also of Nomade. Taught me to push through the exhaustion, put one foot in front of the other, and breathe at high altitude. Mauricio said something at the end of the week that made me feel sad. He said that working in tourism is one of the most thankless professions. He said that travelers always seem enchanted at the moment when they reach the summit, or when they’re in the middle of the experience, but afterwards they forget about you. Travelers, let it be a lesson to all of us: our guides are the ones who give us access, and provide important context, to the most beautiful landscapes and the most exciting adventures when we travel. September 2, 2012 | Filed under Faraway places.